I’m a quick learner. Pain does that to you. At least, it should. The ref blew the whistle and the game started with a rush. I saw an opening to get the flag and took off running. “Let the old man show them how it’s done, right?” I got at least two and a half steps before a searing jolt reverberated through my body and I started to fall to the ground. A direct hit to an unprotected spot. But that was just the start. In the fraction of a second it took me to hit the dirt and surrender, every enemy gun on the field turned toward me and unleashed a hailstorm of fire. By the time I limped to the safety of the sideline, the welts were showing up like relatives after you win the lottery. New strategy: Forget the flag. Get behind this big honking tree and stand there. Lesson learned: When you’re in a war, having something to shield you from the enemy’s missiles is far better than running out in the open. Application: Our war is not against flesh and blood (not even those little zit-faced teens who took me out). Our war is spiritual, and unless we want to take unnecessary shots that could turn us into cowards, we need a shield. God is our protector. Faith in Him alone shields our souls. I can guarantee you this: If you trust in other stuff, you will feel the pain. Do it again, you’ll feel the shame. Satan’s attacks are continual. Each time you run off on your own and take a hit, thank God for His forgiveness and get back to trusting God and protecting yourself with the shield of faith. Father, there are many places I’ve tried to find protection from evil — there are so many ways I run off on my own seeking my own glory and riches, and open myself up to the attacks of Satan. (Ask the Spirit to reveal something specific!) Today, right now, I put my faith in You for all my needs. Thank You for saving me from evil as only You can. Amen. You hear a sermon, go to small group, or read the Bible, and they all talk about what it looks like to live the Christian life. But when you try to put it all together, you struggle to live it out! 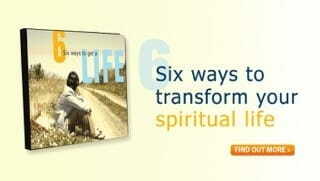 Stuart Briscoe gives you six ways to transform your spiritual life in this powerful 6-message CD series.